Troy Tulowitzki must be wincing somewhere watching Aledmys Diaz injure his ankle stepping on first base wrong. Diaz went down running hard to first base. He stepped on the corner of the bag wrong and twisted his right ankle. Tulo missed the remainder of the season with a broken ankle after being injured on a similar play last July 29. He's still not back after coming into spring training with bone spurs in his heels that required surgery. Thankfully X-rays taken at the stadium were negative. Given the history with Tulowitzki, expect the Blue Jays to take every precaution with Diaz. I fully expect him to be placed on the 10 day DL. This one was a pitcher's duel. Rays starter scattered 5 hits over 7 innings. Estrada had one of his better outings. He kept the Rays off the scoreboard. However, he was throwing too many pitches per inning. It took him almost 40 pitches to get through the first 2 innings. At least he didn't give up a HR, which has been a problem for him this season. Mallex Smith made several base running mistakes, otherwise the Rays might have won this game. Smith held up at third base in the 3rd inning on a single that he could have scored on. Kevin Pillar made a nice throw on the play so it would have been close. He tried to steal home in the same inning but Estrada made an accurate throw to Luke Maile, who easily tagged him out. In the 5th inning, Smith jogged into 3rd base assuming the ball would be caught. Again had he been running hard he could have scored. Ryan Tepera had a rough 8th inning giving up the game tying HR and a walk and single in the inning. It ruined Estrada's chance of a win. The Blue Jays escaped Tampa Bay with a win in the final game of the series against a pitcher who always seems to give them trouble. It also keeps the Rays under .500. Up next, after an off-day tomorrow the Blue Jays begin a three game series against the Seattle Mariners. 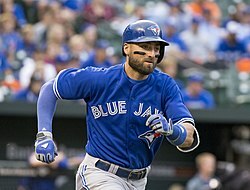 Last season, the Blue Jays won 6 of the 7 games against the Mariners, including a 4 game sweep in Toronto. Marcus Stroman gets the start in game 1 against Canadian southpaw James Paxton, who is coming off a 16K outing.